This time of year the cool crisp weather has us dreaming about the flavors that come with the season. Fall always reminds me of the pumpkin bundt cake my grandma used to always make. I think of my grandma as I create new pumpkin recipes like this easy homemade pumpkin spice yogurt recipe that I am going to share with you today. I love having lots of pumpkin frozen and ready to use in the freezer, of course you can always use pumpkin puree from a can too if you desire. Mix first 8 ingredients together, top with Qi’a or hemp/chia seeds if desired – you may also add more syrup on top if you desire a sweeter flavor. It’s as easy as that – a simple fall treat that you can feel good about eating. 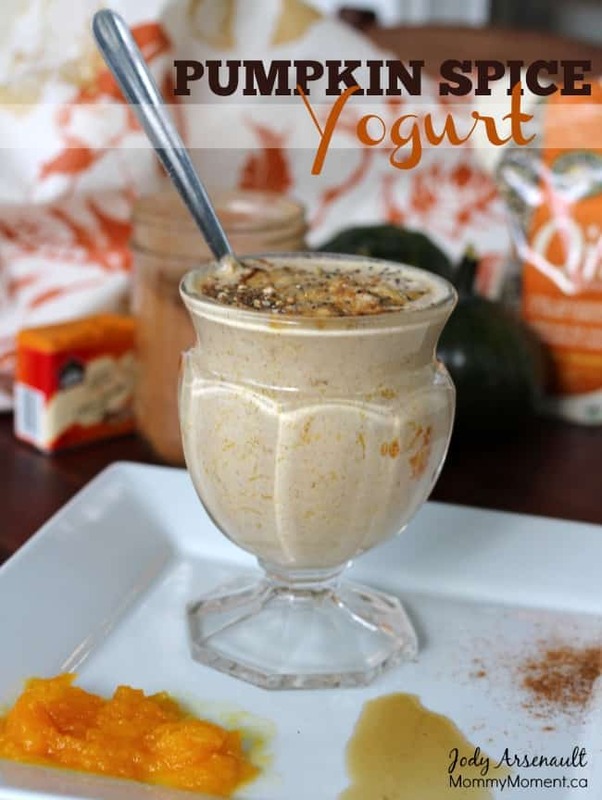 My girls love to call it “Pumpkin Pie Yogurt“. This looks delish and so perfect for Fall!!! I just pinned it too – thank-you! That looks sooooo good! Thanks for the recipe! Love it! Always looking for something to do with the pumpkin I freeze every year! This looks freaking amazing. We love pumpkin everything in our house so this would be such a lovely and different treat (than pumpkin pies, lattes). yum! Love all things pumpkin. Thanks for sharing. I never thought about pumpkin yogurt. My family would love this-a must try! OMG! Why didn’t I think of this? This sound delicious. Going out to get some pumpkin right now.